Fleetwood Town's promotion party was put on hold as they came from behind to draw with Lincoln City. The hosts were two down within 20 minutes, Jamie Taylor's low shot followed by a Jefferson Louis header from John Nutter's free-kick. Jamie Vardy's rebound closed the gap, before he netted his 34th of the season after hesitation in Lincoln's defence. Fleetwood can still be confirmed as champions on Saturday if Wrexham fail to win at home against Grimsby. After a poor first half, Fleetwood bossed proceedings after the break as Jamie McGuire put a header wide and saw a shot well saved by Joe Anyon, while Gareth Seddon had an effort ruled out for offside. At the other end, Louis came close to netting his second of the night, but put his shot just over the bar after a mazy run. 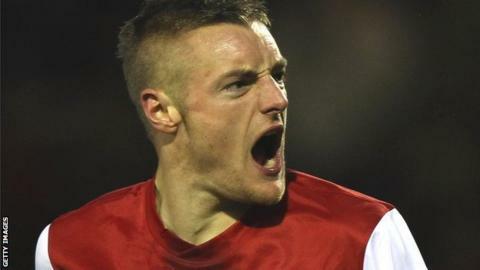 Vardy had two chances to win it for Fleetwood, seal promotion and complete his hat-trick - but first sliced his effort wide when through on goal, and then had an injury-time header palmed away by Anyon. Lincoln, who would have secured their safety from relegation with victory, are now eight points clear of 21st-placed Hayes & Yeading, who have three games remaining.